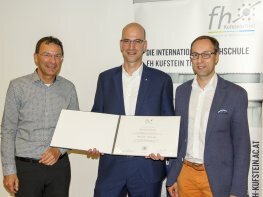 Information and advice to ensure a pleasant and successful working and learning environment on the campus of the FH Kufstein Tirol. The FH Kufstein aims to offer students, lecturers and members of staff an attractive and modern working and learning environment. In order to make this environment pleasant for everyone, there are a few rules and instructions that should be followed. Waste: Please treat the equipment and facilities at the FH Kufstein with care. To protect the environment, we kindly request that you dispose of your waste using the recycling containers provided. The lecture halls and work rooms must also be kept clean. For this reason, eating and drinking are not permitted in the IT rooms. Thank you for your understanding. Smoking: Smoking is not permitted in the buildings and on the campus of the FH Kufstein. This measure aims to provide students, lecturers and staff with a healthy and pleasant working and learning environment. There are, however, a number of smoking areas with special waste bins for cigarettes. CCTV: Please be aware that for safety reasons the entrances to the FH Kufstein are monitored using CCTV. Security: Please be aware that dangerous objects such as guns, knives, explosives, etc. are not permitted on the grounds of the FH Kufstein. This measure is designed to ensure the overall security of students, lecturers and members of staff. Furthermore, scooters, skateboards, bicycles, other sports equipment as well as animals are not permitted in the buildings of the FH Kufstein. Audio and video recording: Please be aware that persons wishing to make audio or video recordings on the campus of the FH Kufstein must first apply to the Department of Corporate Communication and Marketing to receive permission. Fire alarm: If the fire alarm sounds, please leave the building immediately using the emergency route closest to you. The gathering point is in the town park (Stadtpark). There is an emergency first-aid kit on every floor next to the stairs. At the Infopoint on the ground floor there is a defibrillator.